A vision board is a powerful tool that anyone can use to shape an ideal future through the power of intention and visualization. Learning how to vividly imagine your desired results—attracting your perfect soulmate, radiant health, abundant career opportunities, or building personal and community relationships to give back—is the first step on the path to making it happen! Break through the unconscious, limiting beliefs and get ready to transform your future now. If you can envision it, you're halfway there! 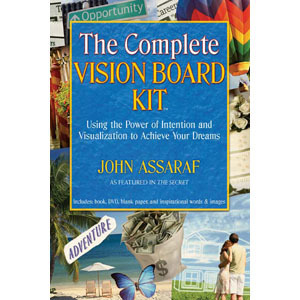 The Complete Vision Board Kit includes John Assaraf's DVD, The Secret to Your Best Year Ever, plus his latest book, The Vision Board Book, which walks you through the entire process of creating and properly using a vision board. Use the included blank vision board and glossy sheet of inspiring words and images to get you started, or go online with a free 14-day trial of John Assaraf's Virtual Vision Board! Kit Includes: 128 page book, 45 minute DVD, blank paper, inspirational words & images, and a free 14-day trial of John Assaraf's Virtual Vision Board online. John Assaraf is one of the experts featured in the film and book The Secret, which he helped launch into a worldwide phenomenon. He has shared his expertise on achieving financial freedom and living an extraordinary life with millions of viewers on Larry King Live, The Ellen DeGeneres Show, and dozens of other media venues worldwide.